Super Mario Party is coming to Nintendo Switch, so gear up and get ready to play with Lunchables! Enter for your chance to win a grand prize – a Nintendo Switch system, a pair of Joy-Con controllers, carrier case, and the Super Mario Party video game! Contest ends on December 31, 2018. One entry per person per day. To enter without a purchase: register/log in and watch the short video from Nintendo. Once you’re done watching, a button will appear below. Click it to play. package of Lunchables, register and enter your code to play. 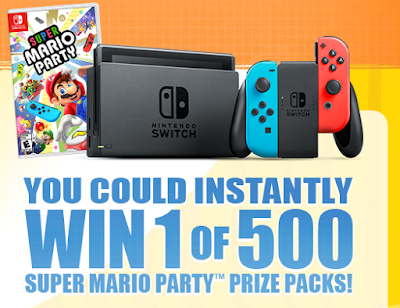 If you do not win a First Prize, you will receive 100 My Nintendo Points. Limit: one Offer per email address/person. Points available while supplies last. A Nintendo Account Is required to receive and redeem My Nintendo Points.